I received this copy from Julia London’s street team, “London’s Ladies”, via Netgalley for an honest review. 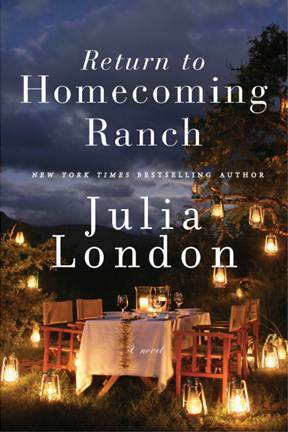 Summary: In the second of Julia London’s Homecoming Ranch trilogy, we return to Pine River, Colorado to get to know Libby , another of the Tyler sisters, who have recently been brought together by their father’s death. Libby, with the aid of her sisters, is trying desperately to figure out how to save their Dad’s run down ranch. While doing this, Libby is also trying to figure out how to save her own life after a humiliating breakup with Ryan, whose two children she has been raising for the past four years, and loves as though they were her own. This devotion to the children brings her nothing but trouble, and confrontation with handsome Officer Sam Winters, who is fighting his own demons. It is inevitable that an attraction is formed between these two. Review: I’m never disappointed with Julia London’s writing, and this is no exception. She always makes me feel for the characters, whether it be positive or negative. I’ve smiled and shed a tear or two. I’m eagerly awaiting the next installment in this trilogy to see what happens with not only Emma, the third sister, but also with the rest of the characters from Pine River whose back stories have yet to be completed.